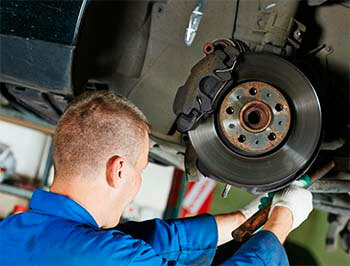 Our mechanics do a personal hands-on job, touching every aspect of quality brake repair. The ‘safety-first’ issue is up-front – then every essential is applied to put your car on the road. We inspect all parts that keep brakes safe. We adjust, clean and lube all slide-points and pins on brake repairs. We replace only parts that need repair, to bring brakes back to original specifications. Our mechanics service calipers, rotors, pads, shoes, wheel cylinders, shocks, struts, hoses and links, when applicable. They’re also looking for mishaps: fluid leaks, loose mounting plates, other broken parts, etc. There is nothing more important when driving an automobile than dependable brakes.